Analysts on Friday hailed the Indian government’s decision to grant visas on arrival to travelers from 180 countries, a move they said would boost tourism, earnings from which could help deflate the country’s bloating fiscal deficit. This is a “game changer for the Indian economy,” Rajiv Biswas, IHS Global’s chief economist for Asia, said in a statement. “The new liberalized visa regime has the potential to make India one of the most favoured tourist destinations of the world,” Jyotsna Suri, the vice president of New Delhi-based Federation for Indian Chambers of Commerce and Industry, said in another statement. 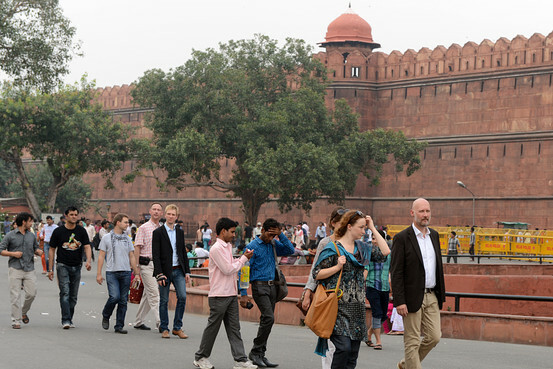 On Wednesday, India announced it sought to extend its visa-on-arrival program to tourists from 180 countries, including the U.K., U.S. and China, in a bid to accelerate slow growth in tourism. Previously, only 11 countries — including Finland, Singapore and Japan — were covered under the scheme, which began in 2010. Those visas were valid for 30 days and cost $60. The Tourism Ministry, in a note on its website, said it found that the scheme had encouraged more tourists to visit India. In 2013 for instance, more than 20,000 visas were issued on arrival, about five times more than in 2010. Under the new program, the ministry said, travelers can register for an Indian visa online. The visas can then be collected on landing at one of the 26 international airports across the country. Rajeev Shukla, the country’s planning minister who made the announcement, said it could take about five to six months to get the expanded visa-on-arrival program off the ground. The first of these visas, he said, are likely to be issued in October. via India’s Visa-On-Arrival: ‘A Game Changer’ – India Real Time – WSJ.